On June 28, the University of the Holy Land held its 25th commencement at Nazareth Village. Nazareth Village is tucked into a corner of the bustling modern city. The land, originally planned to hold a visitor’s center, was found to contain the remains of a first-century terraced farm. It is now a working farm, researched and reconstructed to resemble as closely as possible the way it looked at the time of Jesus. The day’s festivities began with a tour. 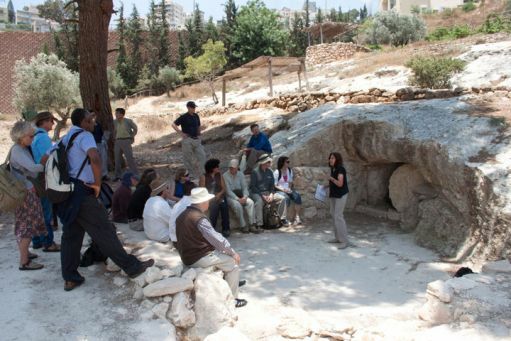 UHL faculty, the graduates, their families, and guests explored a watchtower, cistern, winepress, olive press, and rolling stone tomb, as well as the thriving grape arbor, sheep pen, and threshing floor. Some were able to participate in winnowing the newly harvested grain with a wooden fork, tossing it high in the air to blow away the chaff. This step follows threshing, where a donkey pulls a stone-studded wooden threshing sled atop the grain, helping release the chaff and pulverize the stalks. After winnowing comes sifting: first with a coarse sieve, which catches larger pieces of stalk and chunks of gravel and allows the grain to fall out, and then with a finer sieve, which retains the grain and allows dirt to fall to the ground. 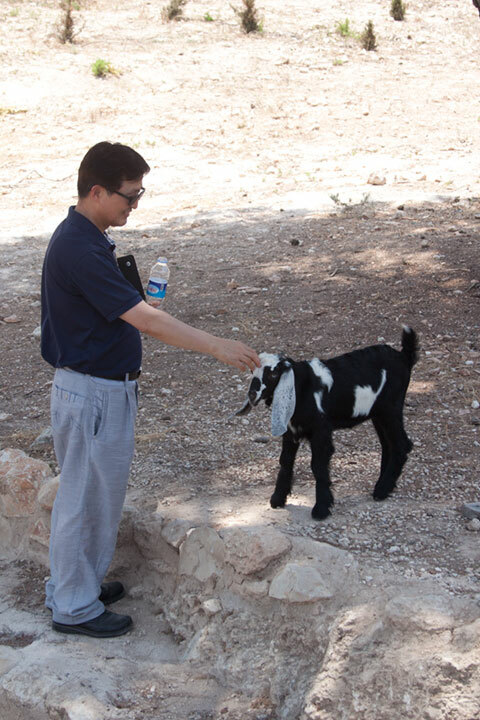 Dr. John Chung, Dean of Asian Students, befriends a young goat. The sheep pen was especially popular with the children. The rolling stone tomb is one of the newest additions to Nazareth Village.